The leader of Indigenous People of Biafra, IPOB, and Director of Radio Biafra, Nnamdi Kanu has arrived the Federal High Court Abuja, as court resumes hearing of the case of the IPOB leader alongside his co-defendants- Benjamin Madubugwu, David Nwawusi and Chidiebere Onwudiwe. 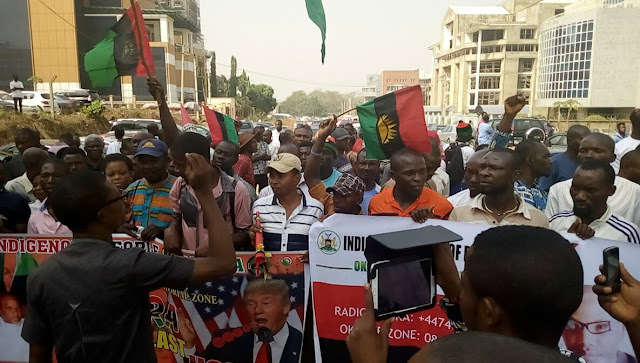 Scores of Biafrans are seen outside the court premises chanting solidarity songs and praying for the victory of Nnamdi Kanu and co-defendants. Military trucks, highly equipped security officials and police dogs have been mounted within and outside the court premises. The judge handling the case, Hon. Ms Binta Nyako and both the prosecuting and defense counsels are already present in court as proceedings is set to commence any moment from now. The High Court is expected to give its ruling on the application filed by Nnamdi Kanu and co-defendants praying the court to quash the 'treasonable felon' charges leveled against them by the Nigeria government who have been unable substantiate the allegations. The Nigeria government had told the court that it can only provide evidence for the case unless the court allows for a secret trial or masquerading of witnesses. Biafra Alive!All ALL HAIL BIAFRA!!! All Hail Her Freedom Fighters!!! God of UmuBiafra, you are the Chukwu Okike Abiama, the creator of heaven and earth, the all knowing God, You sent forth your son Nnamdi Kanu to set free your own people from the hands of the wicked and the enemies the way you sent Moses to deliver the children of Israel from the land of Egypt and Pharaoh. You never abandoned them on the way nor forsake them, God may your promise to Abraham to his descendants be fulfilled in our lives in the mighty name of God. God forth father and free your servant Nnamdi Kanu and your chosen generation Biafra from the hands of the enemies so that we will go to our land and worship you with burn offerings. We look forth that day Nnamdi Kanu and his minsters and ambassadors of freedom will lift up that mantle of leadership you handed over to him and say..Chukwu Okike Abiama, you are the only true living God. Oh! It's a great man! I order essays on this site 99 papers before my conference. Unfortunately, I can`t write so well. Therefore I trust this job to professionals. It gives me confidence during my speech. It was so long ago that I suppose it is better to forger about it. Now you are a good writer and you can proud of yourself! You know as about me, after I ordered several times essays at this resumes writers/. I decided to try writing courses and improve my writing skills.